The Boutique garden event, now owned by the Horticultural Trades Association (HTA) and Garden Industry Manufacturers Association (GIMA) will relocate to the Business Design Centre in London. It was announced at the GIMA Day Conference yesterday that the Garden Press Event will take place on Wednesday, February 28 in 2018 at the Business Design Centre in the heart of Islington, which also plays host to Exclusively Housewares in June. 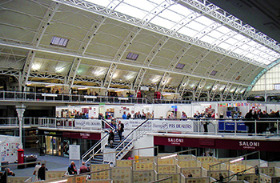 The event, which was bought by the HTA and GIMA late last year, will relocate from its current home at the Barbican provides and the organisations say the new venue offers many advantages, including good transport links, high ceilings on all stands, as well as better facilities and easier loading and unloading for exhibitors. The Garden Press Event provides an opportunity for exhibitors to meet with journalists from a variety of media and update them on the latest products and themes for the season ahead. More than 300 journalists attended the show in February this year. Many exhibitors from the 2017 show have already signed up to attend. HTA and GIMA members benefit from a discounted stand rate and the opportunity to select their stand location before the remaining space goes on general release on Tuesday, April 2.